Ichinoseki City, the southernmost area of Iwate Prefecture, is located between Sendai city and Morioka City. You can make a day trip from Tokyo as it is only about 450 km from the main city. You can ride a Shinkansen (bullet train) from either Tokyo or Sendai city. The tour will start when you get off the train at Ichinoseki City where a local guide will be waiting for you. Ichinoseki City is famous for Mochi (Japanese rice cakes). Mochi is like a traditional Japanese treat, and in Ichinoseki City Mochi is such a big thing that every year they hold a Mochi Summit. 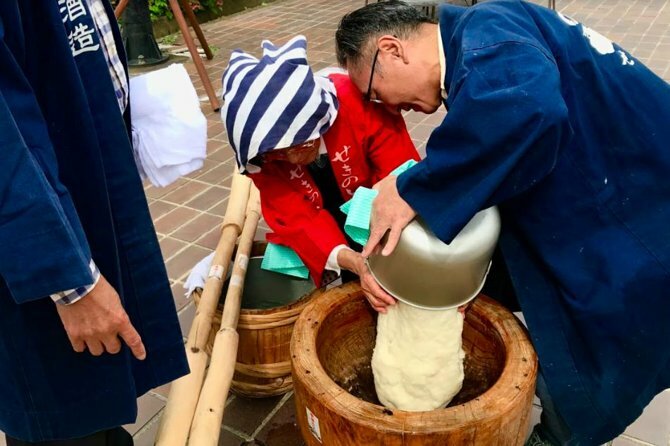 With this tour after you meet your local guide at the station you will be able to experience traditional Mochi making where you will pound the mochi with a wooden hammer! After you finish making your Mochi try out Mochi dishes and other local foods of Ichinoseki City. After you finish your lunch you will take a train and head to the Geibikei area. While you are heading to the Geibikei area your guide will tell you about the many history and interesting facts about the Ichinoseki area. So ask away! You will discover a whole new part of Japan that the local people of that area only knows about. Once you arrive at the Geibikei area you will ride down the Geibikei river. It's about a 40 minute boat ride for one-way and you will be making your way upstream to your destination. This region is well known for its beautiful water and fishes, while you are riding on the boat look down in the water you should be able to see the fishes swimming. This region is not just famous for the fish but you will also see a lot of ducks as well. These ducks are very friendly towards people since they know that there are treats on board so they would actually swim close to the boat. Why don’t you try feeding the ducks? Only for 50 yen you will be able to have fun feeding the ducks. This experience is very local, we are sure that you won’t experience such thing else where. After riding upstream the river for 40 minutes you will have free time for about 20 minutes to take pictures or if you want you can try improving your luck with activities near the area. Why dont you see for yourself, its a very Japanese way of life. At the end, the local guide will take you back to the Ichinoseki City where you will go back looking back at your wonderful adventure at Ichinoseki City.